In mice without the key enzyme, fatty acid synthase, bad bacteria invade the colon and the small intestine. This creates chronic inflammation in the gut and contributes to insulin resistance and diabetes. In the mouse colon above, a protein (shown in red) that makes up the protective membrane in the gut is not functioning properly. The new study, in mice, may upend long-held theories about the causes of the disease. Because insulin is produced in the pancreas and sugar is stored in the liver, many scientists have looked to those organs for the underlying causes of diabetes. The findings are reported Feb. 16 in the journal Cell Host & Microbe. In the new research, scientists studied mice that are unable to make fatty acid synthase (FAS) in the intestine. FAS, an enzyme crucial for the production of lipids, is regulated by insulin, and people with diabetes have defects in FAS. Mice without the enzyme in the intestines develop chronic inflammation in the gut, a powerful predictor of diabetes. 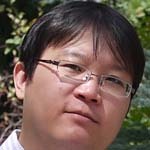 First author Xiaochao Wei, PhD, and Semenkovich, the Herbert S. Gasser Professor of Medicine, professor of cell biology and physiology and director of the Division of Endocrinology, Metabolism and Lipid Research, collaborated with specialists in gastroenterology and genome sciences to determine what happens in mice that can’t make FAS in their intestines. Initially, the researchers thought that the mice became sick because of changes to the mix of microbes that naturally live in the gut, where they help digest food and synthesize vitamins. In collaboration with Jeffrey I. Gordon, MD, director of the Center for Genome Sciences and Systems Biology at the School of Medicine, they looked more closely at gut microbes in the mice. Instead, Wei says, the mice got sick because of a defect in fatty acid synthase. The mice without fatty acid synthase had lost the protective lining of mucus in the intestines that separates the microbes from direct exposure to cells. This allowed bacteria to penetrate otherwise healthy cells in the gut, making the mice sick. 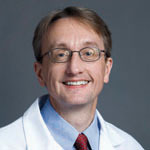 In a further collaboration with Nicholas O. Davidson, MD, director of the Division of Gastroenterology, the researchers found gastrointestinal effects resembling some features of inflammatory bowel disease. Other investigators studying humans with ulcerative colitis had previously made the unexplained observation that colon biopsies from these patients have low amounts of fatty acid synthase. Inflammation and insulin resistance reinforce each other. Inflammatory substances can cause insulin resistance and inhibit the production of insulin, both of which interfere with the regulation of blood sugar. In turn, insulin resistance is known to promote inflammation. Further study showed that the ability to build the thin, but important, layer of mucosal cells was hindered by faulty FAS. That the gut is so important to the development of diabetes makes sense because many people with the condition not only have faulty FAS, but they also frequently develop gastrointestinal difficulties, Semenkovich says. “Abdominal pain and diarrhea are some of the most common problems we see in people with diabetes,” he says. “We could only connect these ‘dots’ because other experts at the university could help us link what we observed in these mice to what occurs in patients with diabetes and inflammatory bowel disease,” Semenkovich says. 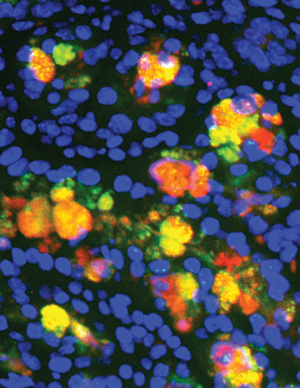 Semenkovich and Wei say much more study is needed, but they say that FAS and a key component of the intestinal mucosa called Muc2 may be potential targets for diabetes therapy. They now plan to study people with diabetes to see whether FAS is altered in a similar way, producing damage to the mucosal layer in the intestines. Wei X, Yang Z, Rey FE, Ridaura VK, Davidson, NO, Gordon JI, Semenkovich CS, Fatty acid synthase modulates intestinal barrier function through palmitoylation of mucin2. Cell Host & Microbe, Feb. 16, 2012. Funding for this research comes from grants awarded by the National Institute on Diabetes and Digestive and Kidney Diseases and the National Heart, Lung, and Blood Institute of the National Institutes of Health (NIH), by the American Heart Association and by the American Diabetes Association.